One of the highlights of this drive was members of First Morning Star Church in Bena donating 45 coats all at once. Church members asked that the coats be offered to the GUEST program first, and it turned out that GUEST had some urgent needs, which could then be filled immediately. 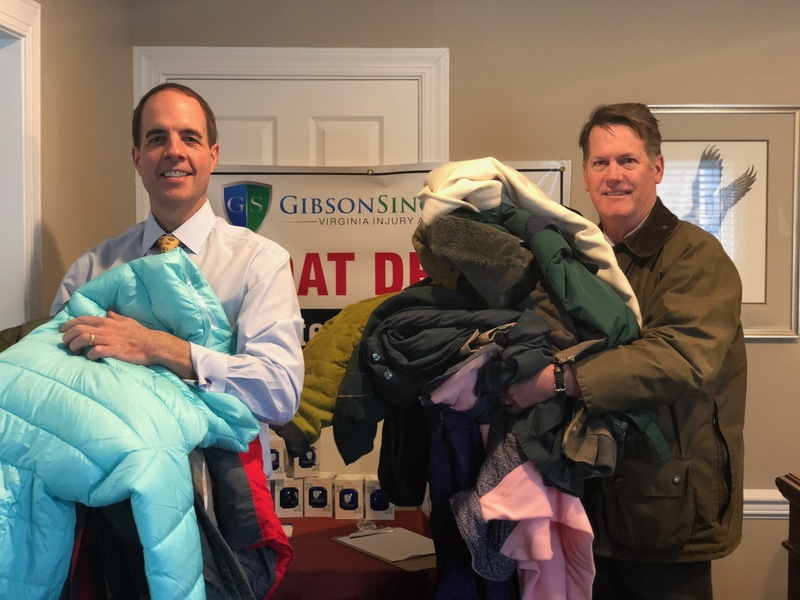 GibsonSingleton law partners Ken Gibson and John Singleton load their final batch of coats to take to the Hampton Veterans Administration Center, which serves many homeless veterans. The community donated more than 640 coats through the annual Fall Coat Drive this year, which were then distributed to people in need through local charitable organizations. Every person who donated a coat was offered a Christmas ornament or ice scraper from GibsonSingleton Virginia Injury Attorneys. More info: Anyone still wanting to donate a coat may give directly to the Salvation Army, Gloucester Center, 7057 Linda Circle in Hayes, across from Franktronics. The hours are 10 a.m. to 3 p.m. Tuesday through Thursday, and the phone number is (804) 642-3960.